Acting Attorney General Matthew Whitaker faced questions about his involvement in special counsel Robert Mueller’s ongoing investigation while testifying in front of the House Judiciary Committee on Friday. 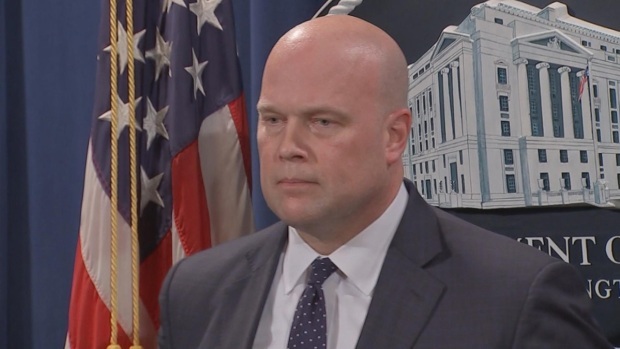 Acting Attorney General Matthew Whitaker said on Friday that he has "not interfered in any way" in the special counsel's Russia investigation as he faced a contentious and partisan congressional hearing in his waning days on the job. The hearing before the House Judiciary Committee was the first, and likely only, chance for newly empowered Democrats in the majority to grill an attorney general they perceive as a Donald Trump loyalist and whose appointment they suspect was aimed at suppressing investigations of the Republican president. They confronted Whitaker on his past criticism of special counsel Robert Mueller's work and his refusal to recuse himself from overseeing it, attacked him over his prior business dealings and sneeringly challenged his credentials as the country's chief law enforcement officer. "We're all trying to figure out: Who are you, where did you come from and how the heck did you become the head of the Department of Justice," said Rep. Hakeem Jeffries. When Whitaker tried to respond, the New York Democrat interrupted, "Mr. Whitaker, that was a statement, not a question. I assume you know the difference." Yet Democrats yielded no new information about the status of the Mueller probe as Whitaker repeatedly refused to discuss conversations with the president or answer questions that he thought might reveal details. Though clearly exasperated — he drew gasps and chuckles when he told the committee chairman that his five-minute time limit for questions was up — Whitaker nonetheless sought to assuage Democratic concerns by insisting he had never discussed the Mueller probe with Trump or other White House officials, and that there'd been no change in its "overall management." Acting Attorney General Matthew Whitaker and Rep. Mary Gay Scanlon, D., Pa., sparred over sanctuary cities on Friday when Whitaker appeared before the House Judiciary Committee. Republicans made clear they viewed the hearing as pointless political grandstanding, especially since Whitaker may have less than a week left in the job, and some respected his wishes by asking questions about topics other than Mueller's probe into potential coordination between Russia and the Trump campaign. The Senate is expected to vote as soon as next week on confirming William Barr, Trump's pick for attorney general. "I'm thinking about maybe we just set up a popcorn machine in the back because that's what this is becoming. It's becoming a show," said Republican Rep. Doug Collins of Georgia, who accused his Democratic colleagues of "character assassination." 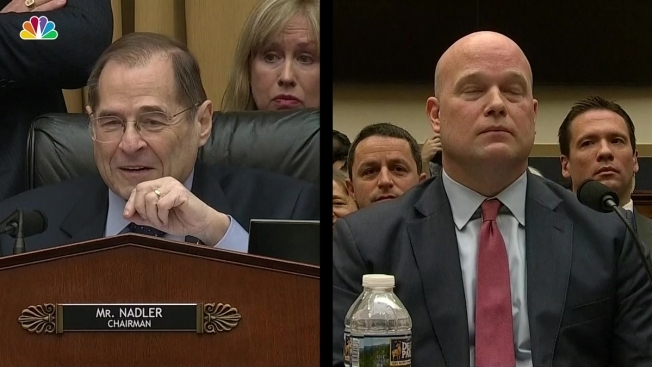 But Rep. Jerrold Nadler, the committee chairman who a day earlier had threatened to subpoena Whitaker to ensure his appearance, left no doubt about his party's focus. "You decided that your private interest in overseeing this particular investigation, and perhaps others from which you should have been recused, was more important than the integrity of the department," said Nadler, of New York. "The question that this committee must now ask is: Why?" Whitaker toggled between defending his role in the special counsel's investigation and echoing the president's talking points, conceding for instance that while foreign interference in U.S. elections was a problem, so too was voter fraud — a key issue for Republicans, but one that Democrats say is overstated. He said he had no reason to doubt Mueller's honesty or to believe that he was conflicted in his leadership of the investigation. Acting U.S. Attorney General Matt Whitaker will face questions today from the House Judiciary Committee. His testimony comes after a threatened standoff. The committee was prepared to issue a subpoena in case Whitaker refused to attend or answer questions. But he also declined to say if he still agreed with sharply critical comments about the Mueller probe that he made as a television commentator before arriving at the Justice Department in the fall of 2017 as chief of staff to then-Attorney General Jeff Sessions. And he passed up a chance to break from the president's characterization of the Mueller investigation as a "witch hunt," saying simply, "I think it would be inappropriate for me to comment about an ongoing investigation." FBI Director Christopher Wray, Deputy Attorney General Rod Rosenstein and Barr have all maintained that they do not believe the investigation to be a witch hunt. Whitaker also denied a news report that Trump had lashed out at him after the guilty plea of Michael Cohen, the president's former lawyer. But he did not answer directly about whether he had discussed that investigation, run by prosecutors in New York, with Trump, insisting only that the president had never instructed him to take particular actions. He said his comment at an unrelated news conference last week that the Mueller investigation was close to wrapping up — a remark that generated significant attention and speculation — reflected only "my position as acting attorney general." He said Mueller would finish on his own schedule. White House officials kept an eye on Whitaker's performance and, while they appreciated his combative tone and aggressive defense of the administration, there was a sense from aides that his performance, at times, appeared halting and ill-prepared. The president himself kept an eye on the proceedings before leaving the White House for his annual physical. Democrats also inquired about Whitaker's past business dealings. Nadler and three other House committee chairmen released documents that they said show Whitaker failed to return thousands of dollars that were supposed to be distributed to victims of a company's alleged fraud. Whitaker has come under scrutiny for his involvement with the invention promotion company, which was accused of misleading consumers. Whitaker, a former U.S. attorney from Iowa, took over when Sessions was forced from the Cabinet last November as Trump seethed over Sessions' decision to step aside from overseeing the Russia investigation. Trump insists there was "no collusion" between his campaign and Russia. Nadler said Friday that he wanted Whitaker to return for a deposition in the coming weeks.